Across the Great Plains, many rivers, smaller streams, and springs periodically go dry; consequently water from wells is a more reliable source. Since the late nineteenth century, the U.S. government has recognized the importance of finding sources of underground water to meet the needs of settlers in the Great Plains. Robert Hay (1895), N. H. Darton (1898, 1899), and Willard Johnson (1901, 1902) of the U.S. Geological Survey (USGS) conducted surveys of the region that helped to locate adequate supplies. Several types of surface sediments that accumulated during the Quaternary period (the last 1.6 million years of geologic history) were recognized in their reports. The Ogallala Formation of late Tertiary age was described first by Darton in some detail from study of the unit in western Nebraska. Darton also identified Tertiary sediment and rock layers older than the Ogallala, called the Arikaree Formation, Gering Formation, and the still older Brule Clay in parts of western Nebraska. Later geologists have recognized that the Ogallala in Nebraska can be subdivided into formations and have raised the Ogallala to a higher level called a group. The Gering Formation has been included in the Arikaree. The name Brule Clay has been changed to Brule Formation, and several widespread subdivisions of the Brule strata have been recognized. The distributions of the Brule, Arikaree, Ogallala, and the Broadwater Formations, all of which were deposited in the middle to late Tertiary period (an interval from 33 million to 1.6 million years ago), have been mapped in Nebraska and adjacent Great Plains states. Only the Ogallala is known from Kansas south. Most of these deposits yield water to wells and springs and are thus parts of an aquifer system, which has been called both the Ogallala Aquifer and the High Plains Aquifer. Water is present in interconnected openings or pore spaces passing through the formations or between sediment grains of the formations. If the openings are large enough to allow the water to move through them, the formations are said to be permeable. Most of the water in the High Plains Aquifer moves through the narrow, interconnected pore spaces between grains of gravel and/or sand (here gravel is any sediment grain larger than two millimeters in intermediate diameter; sand, 2–0.0625 mm; silt and clay have smaller intermediate diameters). Larger fractures and openings enlarged by water erosion have been observed in the several units of the aquifer but are only locally important. Rocks beneath the High Plains Aquifer are generally impermeable and thus act as a seal that prevents water from moving into them. The origins and natures of the various units diãer. The upper parts of the Brule Formation are primarily composed of volcanic dust and ash, carried by winds from erupting volcanoes in the west to the northern High Plains and deposited as blankets over the region. After the Brule was deposited, rivers draining across the developing High Plains eroded valleys into the formation. The deeper parts of the valleys were filled with river deposits, consisting largely of reworked volcanic debris of the Gering Formation. Most of the remainder of the Arikaree Group is wind-deposited volcanic ash that fills the parts of the ancient valleys above the Gering. 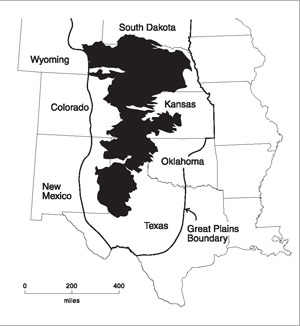 The Ogallala Group is a complex and heterogeneous mass of sediment mostly composed of river alluvium derived from erosion of the southern Rocky Mountains. During deposition of the Ogallala and the younger Broadwater Formation, rivers repeatedly eroded valleys and then filled these valleys. Minor finer-grained lake sediments, volcanic ash deposits, and lime-cemented soil horizons occur throughout the Ogallala sequence. Wind-deposited sands are common in the Ogallala in the Southern High Plains. Quaternary river alluvium, wind deposits, lake beds, and volcanic ash layers cover much of the High Plains and fill parts of valleys cutting across the High Plains. The USGS estimates that in 1980 the aquifer contained about 3.25 billion acre-feet of drainable water (an acre-foot is the volume of a oneacre area one foot thick or 43,560 cubic feet). If impounded on the surface, this volume of water would cover the High Plains region to an average depth of about thirty feet. Most of the water in the aquifer comes from precipitation on the High Plains. With the increase of irrigated agriculture, water levels have dropped in places where the groundwater from the aquifer was pumped out faster than water from precipitation moved through the sediments and rocks to replace it. In other areas, water levels have risen where precipitation has allowed water to infiltrate the aquifer at rates greater than those at which water was pumped out, or where reservoirs and canals have lost water to the aquifer at rates greater than the withdrawal. See also PHYSICAL ENVIRONMENT: Geology. Darton, N. H. "Geology and Water Resources of Nebraska West of the One Hundred and Third Meridian." U.S. Geological Survey 19th Annual Report, Part 4 (1899): 719–85. Dugan, J. T., and Sharpe, J. B. "Water-level Changes in the High Plains Aquifer—Predevelopment to 1994." U.S. Geological Survey Water-Resources Investigations Report 95–4208 (1996). Johnson, W. D. "The High Plains and Their Utilization." U.S. Geological Survey 22nd Annual Report, Part 4 (1902): 631–69.